Is Conagra Brands, Inc. (NYSE:CAG) a buy right now? Hedge funds are becoming less hopeful. The number of bullish hedge fund bets went down by 5 recently. 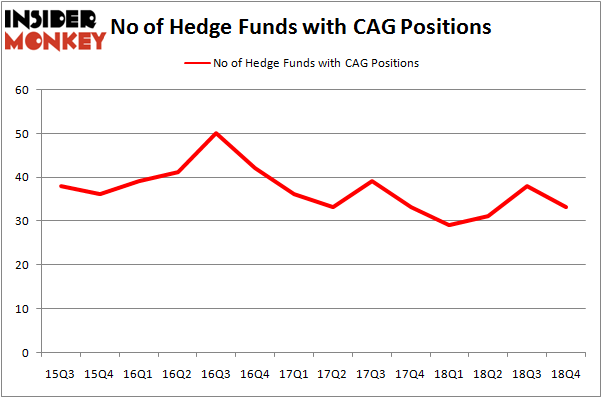 Our calculations also showed that CAG isn’t among the 30 most popular stocks among hedge funds. We’re going to take a peek at the fresh hedge fund action encompassing Conagra Brands, Inc. (NYSE:CAG). How are hedge funds trading Conagra Brands, Inc. (NYSE:CAG)? Heading into the first quarter of 2019, a total of 33 of the hedge funds tracked by Insider Monkey were bullish on this stock, a change of -13% from one quarter earlier. Below, you can check out the change in hedge fund sentiment towards CAG over the last 14 quarters. So, let’s examine which hedge funds were among the top holders of the stock and which hedge funds were making big moves. According to Insider Monkey’s hedge fund database, JANA Partners, managed by Barry Rosenstein, holds the largest position in Conagra Brands, Inc. (NYSE:CAG). 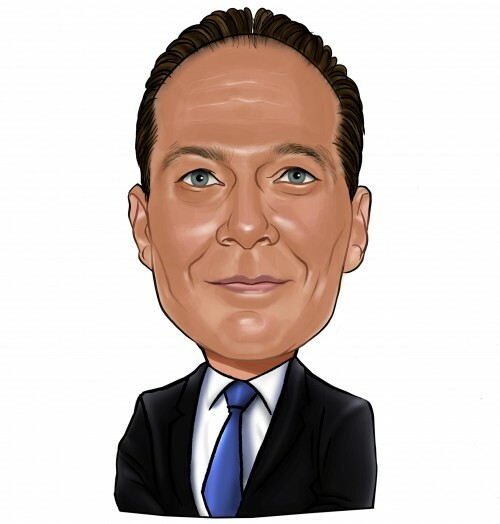 JANA Partners has a $289.3 million position in the stock, comprising 13.2% of its 13F portfolio. On JANA Partners’s heels is Citadel Investment Group, managed by Ken Griffin, which holds a $72.7 million position; less than 0.1%% of its 13F portfolio is allocated to the stock. Other hedge funds and institutional investors that hold long positions contain D. E. Shaw’s D E Shaw, Israel Englander’s Millennium Management and Mario Gabelli’s GAMCO Investors. Due to the fact that Conagra Brands, Inc. (NYSE:CAG) has experienced declining sentiment from the aggregate hedge fund industry, it’s easy to see that there is a sect of funds who were dropping their entire stakes last quarter. Interestingly, Anand Parekh’s Alyeska Investment Group sold off the biggest investment of all the hedgies tracked by Insider Monkey, worth close to $66.8 million in stock. Alexander Mitchell’s fund, Scopus Asset Management, also cut its stock, about $61.1 million worth. These bearish behaviors are important to note, as total hedge fund interest fell by 5 funds last quarter. Let’s go over hedge fund activity in other stocks – not necessarily in the same industry as Conagra Brands, Inc. (NYSE:CAG) but similarly valued. These stocks are Raymond James Financial, Inc. (NYSE:RJF), Varian Medical Systems, Inc. (NYSE:VAR), Live Nation Entertainment, Inc. (NYSE:LYV), and Domino’s Pizza, Inc. (NYSE:DPZ). This group of stocks’ market valuations match CAG’s market valuation. As you can see these stocks had an average of 31 hedge funds with bullish positions and the average amount invested in these stocks was $1063 million. That figure was $678 million in CAG’s case. Live Nation Entertainment, Inc. (NYSE:LYV) is the most popular stock in this table. On the other hand Raymond James Financial, Inc. (NYSE:RJF) is the least popular one with only 25 bullish hedge fund positions. Conagra Brands, Inc. (NYSE:CAG) is not the most popular stock in this group but hedge fund interest is still above average. This is a slightly positive signal but we’d rather spend our time researching stocks that hedge funds are piling on. Our calculations showed that top 15 most popular stocks among hedge funds returned 19.7% through March 15th and outperformed the S&P 500 ETF (SPY) by 6.6 percentage points. Unfortunately CAG wasn’t in this group. Hedge funds that bet on CAG were disappointed as the stock returned 9.2% and underperformed the market. If you are interested in investing in large cap stocks, you should check out the top 15 hedge fund stocks as 13 of these outperformed the market. Were Hedge Funds Right About Souring On Vornado Realty Trust (VNO)? Were Hedge Funds Right About Flocking Into Marvell Technology Group (MRVL)? Were Hedge Funds Right About Dumping Elanco Animal Health Incorporated (ELAN... Hedge Funds Haven’t Been This Bullish On DexCom, Inc. (DXCM) Since 2015... Is Seagate Technology (STX) A Good Stock To Buy? Do Hedge Funds Love Lincoln National Corporation (LNC)?